Even though traditional gender roles are rapidly diminishing with time, they continue to influence our outlook on relationships. Many modern individuals are adamant about freeing themselves of traditional stereotypesand as time goes on, we are seeing new traditions evolve. Whether during singlehood, dating or engaged life, relationships have been given a modernized approach over the years. We’ve all heard the traditional love story: highschool sweethearts fall in love at first sight and build their lives together. In those days, meeting people seemed to be more relaxed and personal than compared to now. Connections seem as if they were made effortlessly and continued to be strong throughout the course of the whole relationship. Today, the struggle to find a long lasting connection with someone can be overwhelming. Social media plays a major role in this disconnect, causing us to be closer with our phones than with each other. We may falsely feel more connected because of the ability to talk through phones at all times, but the reality is that these connections are only skin deep. Many people are opting to have the new-age version of a pen pal, where they text each other for months but never take the relationship any further. However, technology doesn’t always have to put a damper on dating life. Online dating, a popular modern trend, seems to be the new way to find your perfect match. With roughly 49 million people having tried online dating, most people have found it to be the preferred way of dating, even if they were skeptical at first. Traditional style couples would often wait to make any big steps, such as moving in with one another, until after an engagement and wedding. Nowadays, cohabitation between partners prior to marriage is becoming the norm. Today, nearly seventy-five percent of women age thirty or younger said they have lived with a partner outside of marriageat some point in their lives, whereas sixty-two percent said the same in 1995. Not only is moving in together at an earlier stage in the relationship quite common, but also couples are splitting expenses equally. It no longer relies on one person to foot the bill in a partnership, rather both contribute monetarily. This has shown to establish a healthy atmosphere in relationships by setting the precedent that both partners play an equal role. One of the most traditional customs in a relationship is the proposal, where the man surprises his partner by getting down on one knee and popping the question. This has become less common today, and the engagement is often discussed before rather than appearing out of thin air. A more modern trend is that many couples are picking out their rings together. Whether they visit a jewelry store or browse sites online, like Blue Nile, for their engagement rings, couples are turning this once solo process into a joint effort. In addition to shopping together for the ring, splitting the cost has also become relatively common. The thought behind this is if you plan to split finances anyway, it's a price tag that’ll end up affecting both of you down the line. According to a 2017 Jewelry and Engagement Study done by The Knot, one third of couples search for ring styles together, and seventy percent of brides know how much their partner spent on the ring. Regardless of what tradition defined as the rules, today’s couples seem to do whatever they feel works best for their relationship. When classic elegance and soft romance come together you get this beautifully energetic wedding! 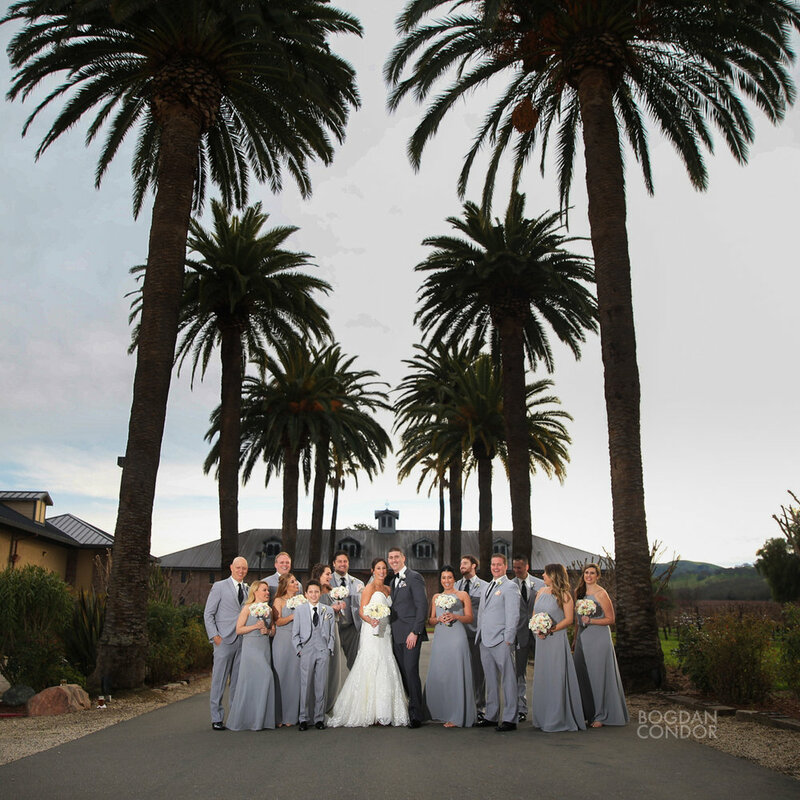 The venue, Palm Event Center in Pleasanton has a perfect feel to bring out the romantic elements of this wedding. The bride carried her soft textured bouquet that included white roses, white stock, lisianthus, fragrant gardenias, ranunculus, and grey brazilia berries. The dove grey bridesmaids dresses and the soft blush touches in their bouquets added to the softness of this wedding, while the darling little flower girls carried small rose bouquets. 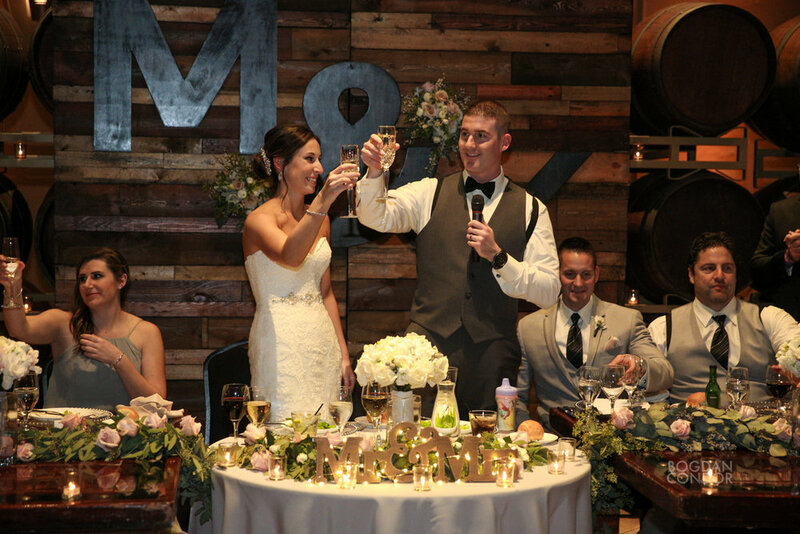 The romantic candle lit ceremony to the elegant reception with soft rounded table centerpieces all flowed perfectly together. 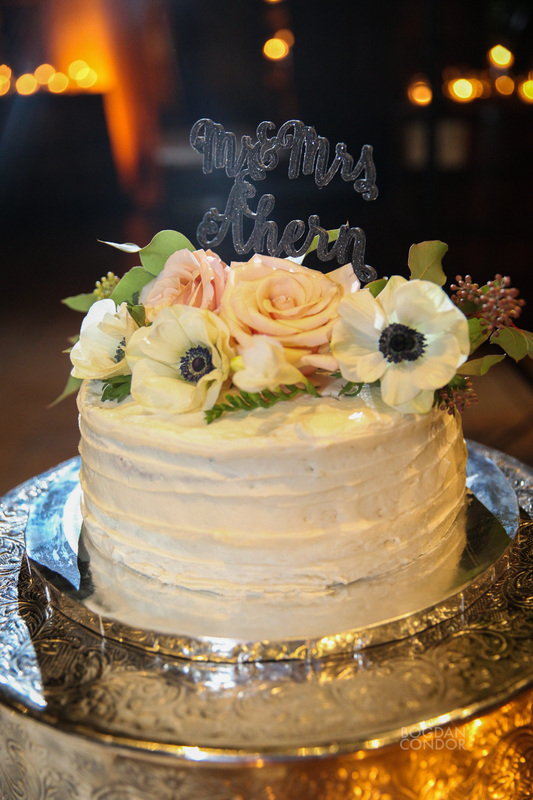 The large wood wall behind the head table adorned with the bride and grooms initials was decorated with small floral arrangements, while the head table had seeded eucalyptus garland with tucked in flowers, the cake was topped with an assortment of flowers including anemones, roses, freesia and greenery. The lovely photos were captured by Bogdan Condor.